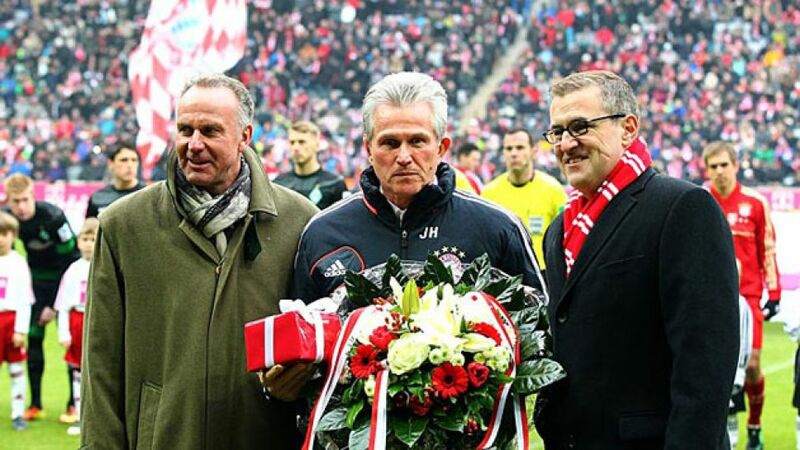 Munich - FC Bayern Munich made Jupp Heynckes' 1,000th Bundesliga game as a player and coach an occasion to remember with a 6-1 drubbing of SV Werder Bremen at the packed-out Allianz Arena. Here's the veteran tactician's verdict on the victory, as well as his fellow coaches' reactions to the weekend's top tussles. Jupp Heynckes (Bayern): "With six changes to the starting line-up, we needed 20 minutes to find our rhythm. We saw some great goals. The one we conceded wasn't part of the plan - that was a bit annoying - but given such an opulent victory, you can afford to let in a goal like that. The new players that came in fully justified my faith in them." Thomas Schaaf (Bremen): "It was an unsatisfactory afternoon, there's no doubt about that. We held our shape well early on, but clearly when you lose that shape it just gets ever more difficult, not least when you're a man down." Lucien Favre (Gladbach): "We were too passive in the first half. After the interval we were more aggressive and pro-active. Both sides could have won it in the end. We can live with a 1-1 draw." Jürgen Klopp (Dortmund): "For the first hour we put in a really good away performance. As the game progressed our level dropped off slightly, which allowed Gladbach back into it. You can do worse than come away from Mönchengladbach with a draw. We're not happy about it, all the same." Jens Keller (Schalke): "We played very well in the first half, the way we set out to. We were looking to win the ball early, defend high up the pitch and chase the win, and were rewarded with the opening goal. We should have made it 2-0 right at the start of the second half, but unfortunately we didn't. At the end of the day, we're just happy to have bagged the winner." Norbert Meier (Düsseldorf): "Congratulations to Schalke. We knew they'd try to put us under pressure from the start. Ten minutes before half-time we started to press forward more ourselves and, after the interval, we put on quite a different show, playing with more conviction and pulling level. That certainly didn't help our opponents' confidence. We need to learn to take something from this kind of performance." Markus Weinzierl (Augsburg): "We executed our strategy well, winning our man-on-man battles and playing some decent football as well. The second goal was a huge relief. The fact that we had to take it down to the wire in the end is my only complaint. We'll do everything we can to defend the position we're in now." Marco Kurz (Hoffenheim): "We were too cautious at the start and couldn't match our opponents' desire and commitment. Overall, it was a below-par performance - we weren't a real team out on the pitch. We're in a very bad situation at the moment and we need to tackle it head-on. It's all pretty sobering at the moment." Ludwig Preis (Fürth): "The guys have to do more. We're not giving up. That was a first sign of life. They put everything into it. It's just a shame the lads couldn't get the win." Sascha Lewandowski (Leverkusen): "The game went through different phases. We didn't play with enough tempo in the first half hour. After the break we really should have taken the lead. From the 65th minute we became a bit restless and gave Fürth opportunities to counter. Even though Fürth made it uncomfortable for us, we're disappointed."